Debutant filmmaker Neeraj Pandey deserves kudos for portraying the topic of patriotism with a difference. Unlike movies depicting foreign nationalist or terrorist creating trouble in India, the movie depicted how a simple and earthy common in his 60’s shakes the police machinery and gets the culprits of terror 7/11 attack in Mumbai eliminated using his brilliance. The movie showcased that India was no longer willing to be at the mercy of a hapless government. Both Naseeruddin Shah and Anupam Kher played their roles brilliantly. 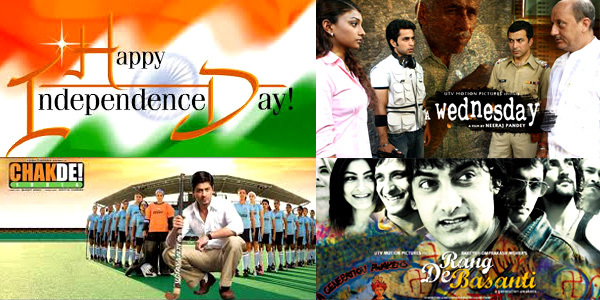 Rakeysh Omprakash Mehra’s RANG DE BASANTI shall go down in the annals of Indian cinema as a patriotic movie par excellence. What made the movie different was Mehra’s excellent script that drew parallels with the atrocities and vices of British government with that of prevailing democratic government in modern India. Based on the true story of India’s hockey captain Mir Ranjan Negi who was accused of favoring win to Pakistan team because he was a Muslim, the movie depicted when it comes to sport patriotism takes over emotions and religion takes a backseat. Shah Rukh Khan played the role of Mir Ranjan Negi, who after being disgraced from the Indian hockey on charges of a being a traitor becomes the coach the Indian women’s hockey team and helps them win thus cleaning the blot of a traitor!